I coach triathletes and runners focused on Ironman and Marathon training. Besides the coaching services listed below, I offer performance and physiological specific evaluations, and personal training for endurance athletes also. I prefer to work together with my athletes, customizing training plans and setting goals according to each one's possibilities, availabilities, and main goal. IRONMAN Certified Coach since OCT 2015. “Your goal is my goal”. Living and breathing triathlon since 1993, I started competing in early 90’s. In 2002 I had my first experiences as triathlon and marathon coach. I’ve completed 4 Ironman races (PR 11:19), 8 IM70.3 (PR 4:33), several Olympic- (PR 2:09) and sprint-distance (PR 1:06) races. Previous my triathlon experience, I have a collegiate swimming and water-polo background. 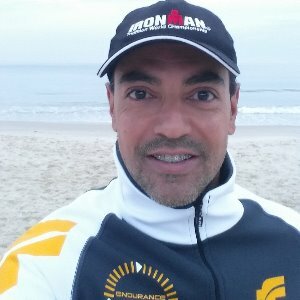 My academic background is masters degree in Sports Science (USP, Brazil) and collaborator at Endurance Performance Research Group of Sao Paulo University (USP, Brazil). Athletes must have commitment & discipline. Smartwatches are required for all-level athletes (cyclists, runners & triathletes). Power meters are welcome for cyclists & triathletes. Success. Coach Rogerio Silva has been notified of your message.